First Line: Randall Blackburn's muscled frame did not strain at the long uphill hike, even though the route led from his policeman's beat in the waterfront district all the way back to the City Hall Station. 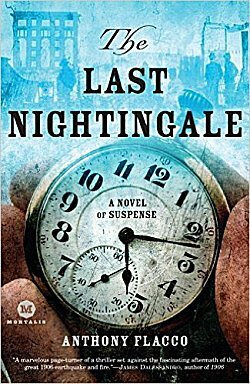 It's 1906, and while the city of San Francisco is being devastated by an earthquake, so is the life of twelve-year-old Shane Nightingale. While others are fighting fires and pulling loved ones out of the rubble, Shane is paralyzed with fear, hidden away and forced to listen to his adoptive mother and two sisters being slaughtered by a serial killer San Francisco calls The Surgeon. Shane fits right in with all the rest of the residents who no longer have homes. Just another anonymous face wandering the streets-- until he meets Sergeant Randall Blackburn, a policeman who's trying to capture The Surgeon. Together the two will form an unlikely team: Shane's intuitive skills will join Blackburn's crime fighting skills in an effort to put a stop to a sadistic killer. Flacco's screenwriting skills come to good use in depicting both the San Francisco earthquake and its aftermath. These scenes are excellent, as are the ones showing a police force and city government rife with corruption. The setting really kept my attention. The relationship between young Shane and Blackburn is also well-done, and I can see it working well in future books. Where my attention began to wander was with the author's sometimes awkward writing style, which could have benefited from closer editing. There is also quite a bit going on with The Surgeon, whose identity is revealed early on. Perhaps there's too much going on. Besides the motivation for the way he kills his victims, there is motivation for why he chooses the Nightingale family. A subplot in which the killer wants to bring plague down on the city is superfluous and could have been left out altogether instead of being allowed to get lost in the narrative. The Surgeon is even after another character in the book. The plot needed to be streamlined a bit, which would have improved both the feeling of suspense and the story's believability. The Last Nightingale is strong on setting, but lacking a bit in storytelling power. On a side note, the digital edition of this book could use some editing, with several instances of Blackburn's name being misspelled as well as the name of a department. Hmm.....I do like historical mysteries, Cathy. But I'm not much of a one for the serial killer motif. And I know what you mean about awkward writing. Not sure I'll read this one, but I'm glad you found some things to like. There's nothing much new under the sun when it comes to serial killers, is there, Margot?